Whether you are an established real estate agent or brand new to the profession, real estate expert Debbi DiMaggio wants to help you achieve real estate success. She explains why you should treat everyone like a VIP, but always remain “captain of the ship.” She starts with the importance of selling yourself, and includes rules for marketing properties, working with clients, and building your business. Read one rule a week—or all 52 at once! Real Estate Rules! 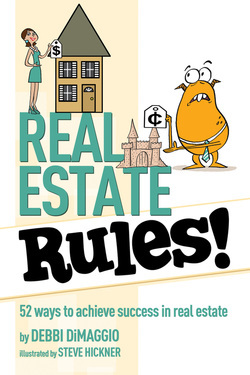 is your guide to success in real estate. ​PRAISE FOR REAL ESTATE RULES!